5 Bedroom Terraced House For Sale in Manchester for Offers in excess of £310,000. 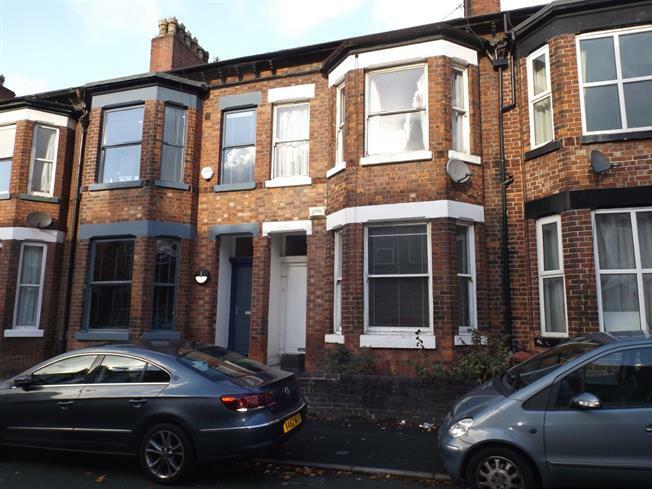 This five/six bedroom period property has the potential of some great income situated close to Wilmslow Road and all transport links into Manchester City Centre. In brief the property has an large entrance hallway, two good size reception rooms, fitted kitchen, access to the cellar to the ground floor, three double bedrooms and bathroom to the first floor and two double bedrooms to the second floor. This property is being sold vendor chain free and viewings are highly recommended. Radiator, carpeted flooring, original coving, ceiling light. Single glazed wood bay window facing the front. Radiator and gas fire, carpeted flooring, original coving, ceiling light. Single glazed wood sash window facing the rear. Radiator and gas fire, carpeted flooring, ceiling light. Single glazed wood sash window facing the side. Radiator, vinyl flooring, part tiled walls and tiled splashbacks, ceiling light. Granite effect work surface, wall and base units, stainless steel sink with drainer, space for oven, space for dishwasher, space for. Double bedroom; single glazed wood bay window facing the front. Radiator and open fire, carpeted flooring, original coving, ceiling light. Double bedroom; single glazed wood window facing the rear. Radiator, carpeted flooring, ceiling light. Double bedroom; single glazed wood sash window facing the rear. Radiator, carpeted flooring, ceiling light. Single glazed wood sash window facing the side. Radiator, vinyl flooring, ceiling light. Low level WC, panelled bath, shower over bath, pedestal sink. Single glazed wood window facing the rear. Carpeted flooring, ceiling light. Double bedroom; double glazed wood skylight window. Radiator, carpeted flooring, ceiling light.